Well here we go in the first of our Micro Monday Tuesday theme, I thought it would only be fitting to start with a ready meal. This week we go to Tesco for their Chicken Curry and Rice. The packaging describes it as being. 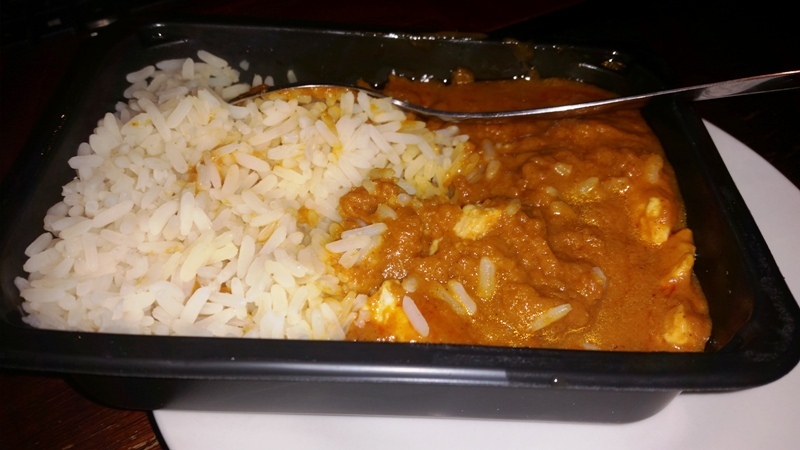 Tender pieces of chicken breast in a mild curry sauce served with rice. 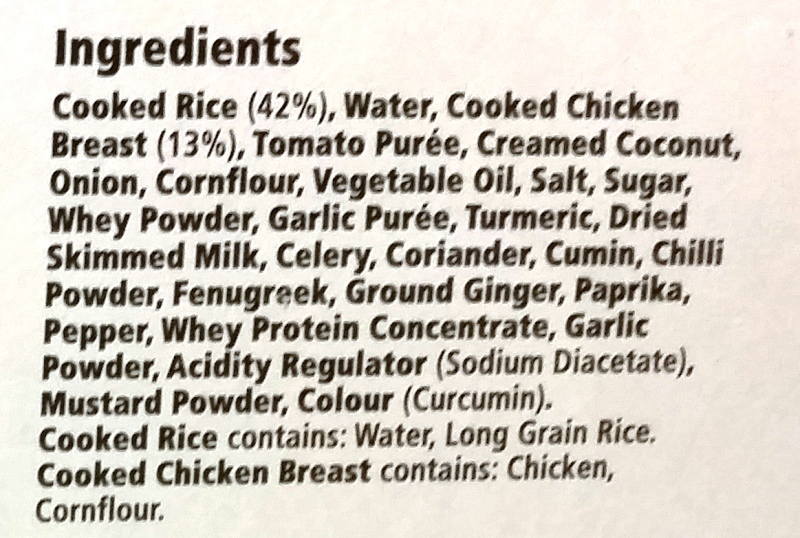 It also adds that there are “no artificial preservatives, flavourings or colours” something that is always good to know. Curry is such a bland term, I may have said before it’s not really recognised by the Indians, it’s more of a westernised term for gravy or sauce. There are many, many different varieties of curries in Asian food that one generic term doesn’t cover it. This was nice, nice is another bland word I know lol but i don’t know another word to use really. It didn’t set my world alight but I certainly eat it again. Going back to my comment earlier about the different types of curries, this was a little like a Korma. 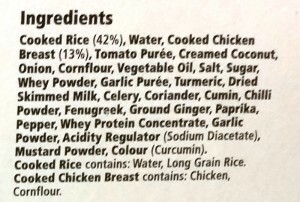 From the first mouthful I could taste coconut in it, this was confirmed by the ingredient list (above). 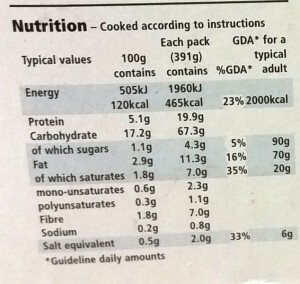 The ingredient list states that the dish contains coconut cream, that gives it it’s rich taste. 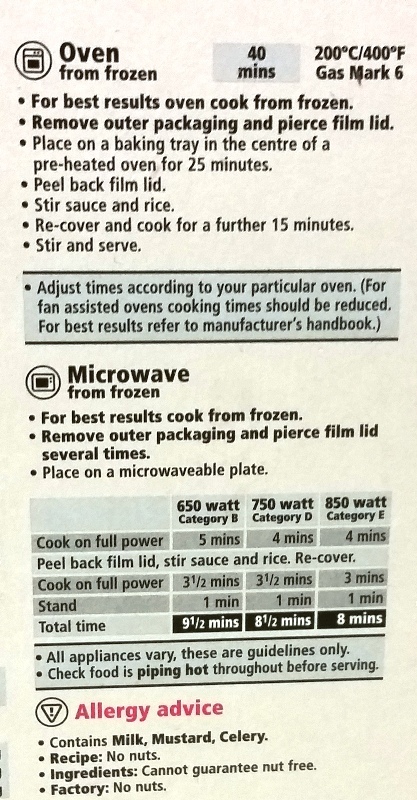 The cooking times (above) were a bit confusing, there is too much repetition and I, honestly feel, that this would confuse someone with a learning disability. I am not electrically minded but even a no-mark like me knows that there is a distinct difference between 650W and 850W so why do the instructions not really reflect that. 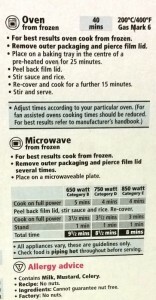 I have to worry that some people have difficulty in cooking their food because of the timings. 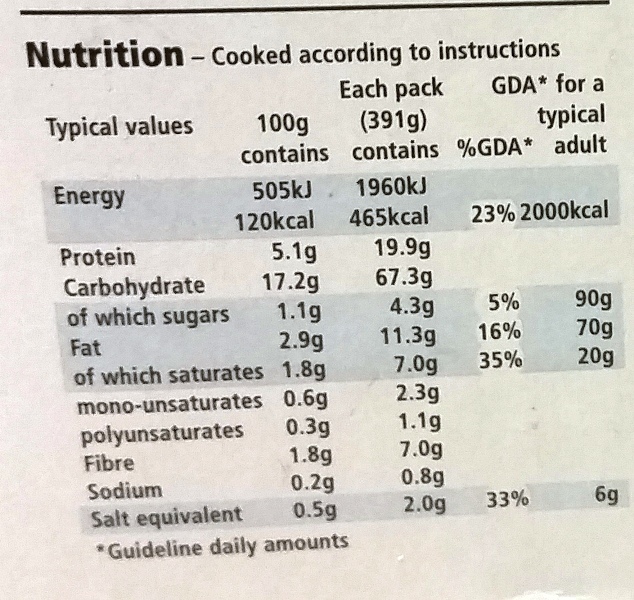 The nutritional information is clear and concise with 465 calories per meal. I’m not dieting during the new year but I am trying to eat a bit more sensibly so I will be trying to get my head around calories and what is healthy and what isn’t :)… can you help? Let me know by emailing us or joining us on social networking. My only observation is that there was a lot of rice, for me, and it’s just a personal opinion the ratio of rice to sauce wasn’t balanced well and I ended up leaving some of the rice. 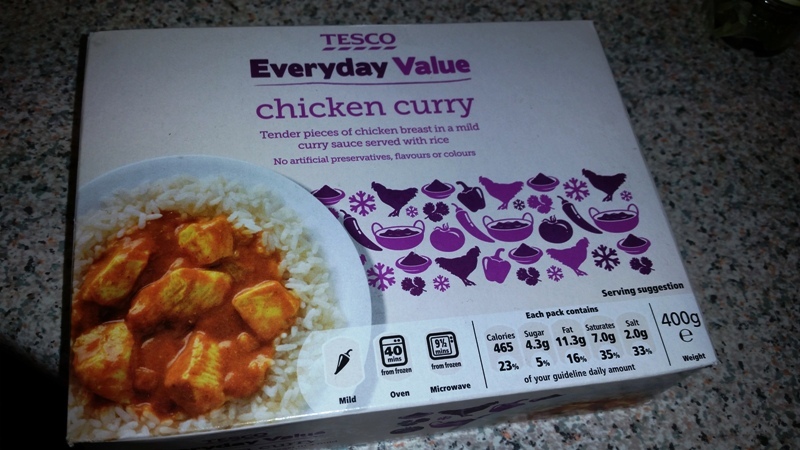 As I said earlier I would order this again, but it wasn’t the best Tesco Ready Meal I’ve had (hence the 5 stars). The rice, although in my mind too much, was fluffy and easy to eat, the chicken was soft and moist and the sauce was tasty (coconutey and tomatoey <excuse spelling>) and was rich in colour. Don’t forget to subscribe to the blog and visit us on our social networking pages (links on the left hand side of the page). 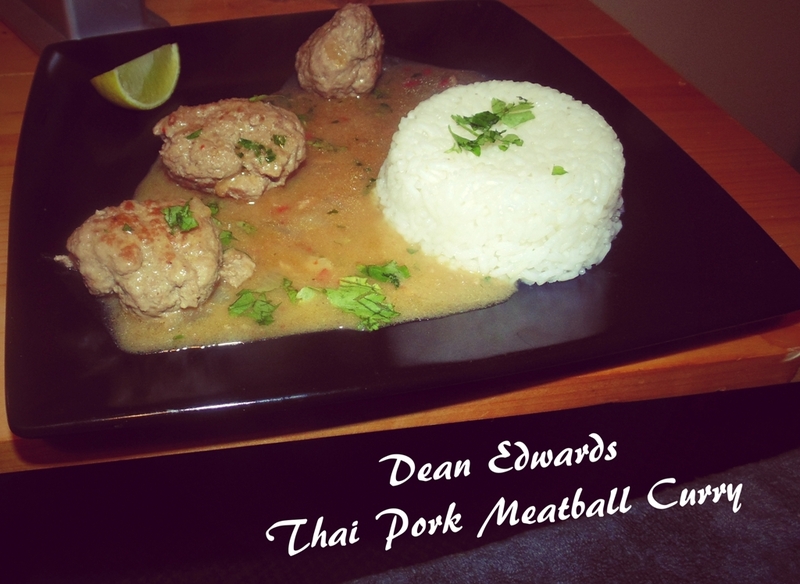 Keep your eyes peeled for more recipes this week, we’ll be making Dean Edward’s (Master Chef 2006 runner up) Thai Pork Ball Curry. Let me know what you want us to cover, get in touch by emailing enquiries@wheeliegoodmeals.co.uk. 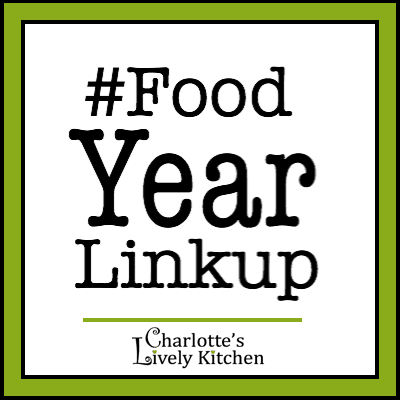 I have to agree with you that “curry” really isn’t a great word to describe something as it covers so many different foods – that said if someone offered me a “curry” I’d expect something along the lines of what you’ve described so maybe it’s about right! When I worked full time I used to live on microwave meals but they’re a rarity in my house now as I prefer to cook from scratch.